Service is much improved from what it was a couple of years ago. Eric S**** has been our service technician for the last two quarterly maintenance visits. He is courteous, prompt, and professional. He does an excellent job!!! Levi did a great job inspecting my house,gave me the quotes for What I asked and for what he found that needs to be fixed. Great job! Travis is very knowledgeable, quick and professional whenever he comes into our business to do repair work. Very great to work with, would recommend every time. We were doing a line cooler install which required a plumber and electrician and was very time sensitive. Jeffrey was right on time and worked diligently to finish both the plumbing and electrical in the allotted time. He was very knowledgeable and professional. We did need some additional work done a couple days later and Maynard sent Mike Urban to our rescue. Mike was awesome as well and got us up and running before our lunch shift. Thank you to both Jeffery and Mike. Zach Rains is super helpful! Great customer service! Highly recommend Maynard for your company's HVAC needs! Always a feeling of confidence when Travis shows up. Working with older equip and troubleshooting it takes a great deal of skill. I call for both the commercial repairs and for home repairs. Always professional, and show up as soon as they are able. Lines of communication are always open with the wonderful people at their main office. Today I had an emergency situation and repairs were made and I was up and running in about an hour! Thank you!!! Eric S. was extremely professional and prompt, not to mention super nice. He took care of our units and made us feel comfortable in the process. Andy and Xavier were very sweet and professional. They installed a Ring and repaired a bathroom fixture. Josh Weaks was absolutely fabulous. He was very detailed on explaining to me about the efficiency of my equipment. Josh was top of the line when it came to being professional, courteous, knowledgeable. I am now seeking to purchase a new unit thur Maynard thanks to josh and the Maynard team. Very professional and helpful service. I feel I can always count on Maynard Select and their employees. Todd is so professional, personable and knowledgeable. Richard installed my Tankless water heater last year. At the time we discussed a descaler for it but I couldn't afford it at the time. He informed me that we could install it anytime and I told him we would this year when it came time to descale my unit. He came out and did the work promptly, efficiently and was a true professional. 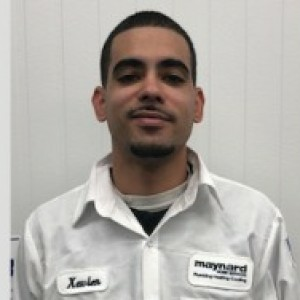 I will use Maynard in the future and will always ask for him to be my service technician. Andy came and did a great job on short notice. Really helped us out of a bind. Mr. TRAVIS IS VERY PROFESSIONAL AND INFORMATIVE IN HIS WORK. Justin and Nick arrived within a couple of hours after we called about our heating problem. They diagnosed the problem within minutes, determined that the part was under warranty, and picked up the part and installed it. We were impressed with their knowledge and efficiency. They were also very pleasant and courteous. Justin the HVAC technician was very professional and helpful. He explained product services that the Maynard offers. Also he gave updates of the changes to come in 2020 for the freon in older molder ac units. My Company uses Maynard to fix our kitchen equipment on a regular basis. The last time we used them Travis Edenfield came out and did a great job fixing one of our ovens and helping us haul off another oven that was old and had too many issues.